In this week's Meet the Maker post, we talk to a Maker who has a phenomenal story about taking what life throws at you and turning it around. 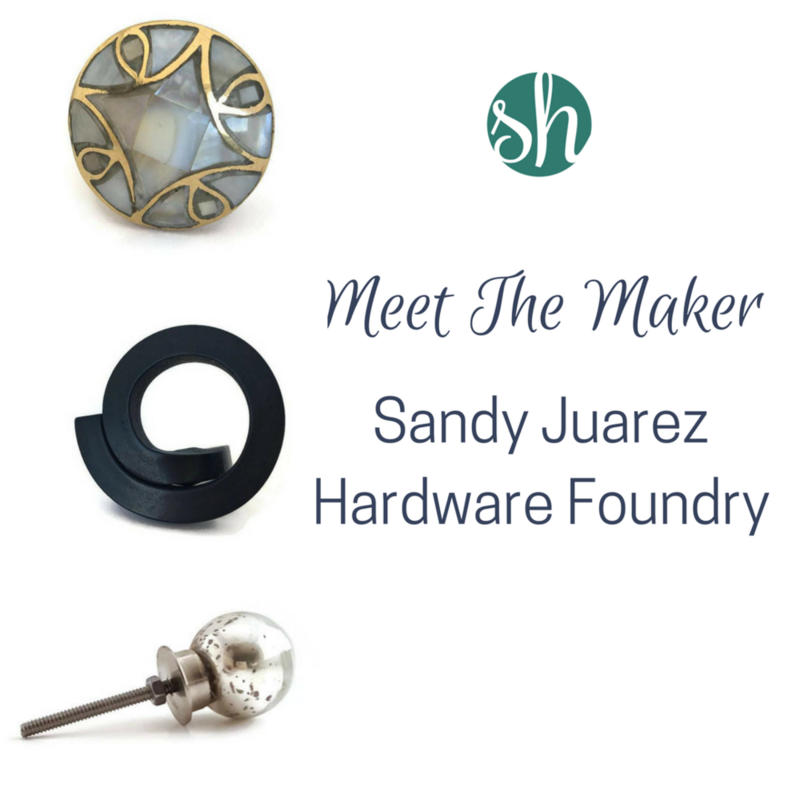 Sandy is in our Successful Makers' Society and her drawer pulls are GORGEOUS. There are several that I am coveting and trying to decide where I could put them. My office needs a cabinet, so I think they will be going there in the near future. Why did you start your handmade business? I’m 60. This wasn’t my plan, but life happens. My husband and I had a design Center for kitchens and cabinetry for 20 years. Then 2008 came and we never quite recovered. I know I can do this....I have always had a very keen eye for design. I am learning by trail and error. I feel like I’ve been going 1step forward and 3 steps back from the beginning. What do you love about having your own handmade business? My daughter told me not to get distracted by shiny things. To keep things small, simple, and manageable and to grow slowly without debt. That this might not work and I’ve wasted a lot of time and resources. I feel a sense of urgency since I am now responsible for taking care of my husband and I. Learn everrrrrrrrrrrything you can about technology. You can do anything with that knowledge! Anything I can find at the dollar store that I can use as a tool, I do! Like popsicle sticks, mixing bowls, plastic spoons, plastic cups....but probably my favorite is my drill attachment that I use to mix my cement. You can find The Hardware Foundry online. Welcome to our new Meet the Maker series! We are features makers just like you. Our first maker is Laura Dixon. Laura makes super awesome wedding bouquets that aren't going to parish. How does she do this? You'll have to read her post below! I was planning my own wedding in 2012 and wanted a unique wedding bouquet that I could keep forever. I am from the UK but was getting married in New York City - I didn't want to throw my bouquet away before I flew home. I stumbled upon button bouquets on the internet and thought 'I could make one of those'...a lot of research, practise and patience later and I had! I made my own wedding bouquet from buttons and brooches, incorporating elements of NYC into the bouquet! I loved making my unique bouquet so much that I wanted to give other brides the opportunity to have one too! Tell us about your handmade business? I work with busy brides to help them create a unique, personalised bouquet so that they can rest assured that they will have something precious to carry with them on their wedding day and to treasure forever. I also make coordinating bridesmaids bouquets, flower girl wands, buttonholes and accessories. Everything is designed and made by me and is unique to each of my brides. My biggest challenge was learning how to make a button bouquet - its tough! I spend many hours over several weeks perfecting my own technique and now have a unique design which I am very proud of! I love that I can give brides the chance to create their own unique bouquet that is full of their personality. I work with them to design a bouquet that is unique to them and that often includes sentimental touches that reflect their life and relationship (for example one of my brides had a charm with her children footprints added to her bouquet). I have posted bouquets all over the world and feel so touched that my brides choose to carry something I made with them on their wedding day. Not to worry about what people think and to go with your heart when making important decisions. Want to be a featured maker?